Desert Trackways: 7-Million-Year-Old Clues To Elephant Social Complexity : 13.7: Cosmos And Culture Discovery of fossilized footprints in the Arabian desert tells us that elephants have lived in complex families for 7 million years. Elephants have adapted to changing conditions for millenia, but can they withstand the stresses we humans inflict today? 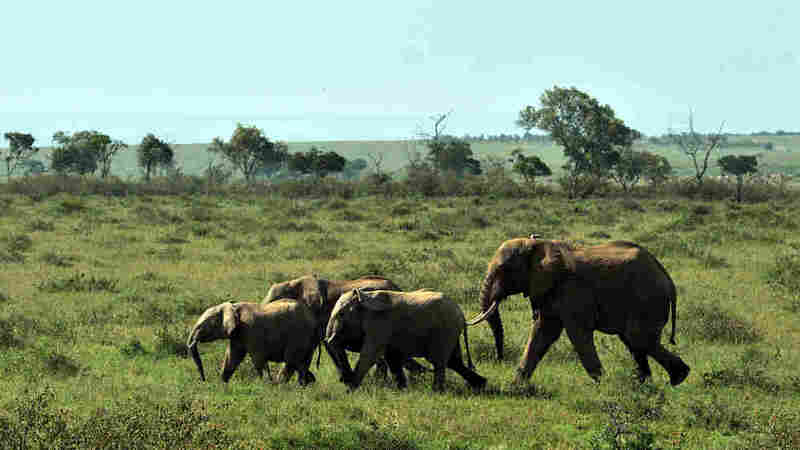 A family of elephants in Kenya's Maasai Mara game reserve. For 14 months of my life I was lucky enough to reside in Amboseli National Park, Kenya. Funded by the National Science Foundation to study baboons, I lived surrounded by a gorgeous array of mammals and birds. I was fascinated, in particular, by the elephants who roamed the savannas and swamps. As I witnessed at Amboseli, the core social units in elephant herds are made up of female relatives and their offspring. In these matriarchal units, bonds are tight. When family members spend time apart, their reunion is often a joyful event, marked by entwined trunks and trumpeted vocalizations. Males remain part of these units only until puberty. After that, they live mostly on their own, joining another herd for mating. Last month, scientists reported an exciting discovery: A series of fossilized footprints suggests that elephants lived in these same family units, with the big bulls roaming alone, 7 million years ago. Paleontologist Faysal Bibi and his research team published their findings in the journal Biology Letters. At a desert site called Mleisa 1 in the United Arab Emirates, two preserved "trackways" of prehistoric elephant prints were found. In speaking with the BBC, Bibi called the footprints "a beautiful snapshot" of the animal's social behavior. The first trackway shows that at least 13 individuals moved simultaneously in a single direction. The variation in footprint sizes and stride lengths guarantees that elephants of different ages and, almost certainly, of both sexes moved together. The second trackway cleanly intersects the first at a single point. These prints were made by a large elephant, very probably a sexually mature male. All indications are that this male was solitary and moved over the landscape apart from the herd. Bibi et al. conclude that "The Meisa 1 trackways provide direct evidence for the antiquity of characteristic and complex social structure in Proboscidea," the taxonomic family that includes living and extinct elephants, as well as mastodons and mammoths. I'm forever telling my anthropology students that "behavior doesn't fossilize." In a sense, the elephant trackways make an exception to that rule. Strictly speaking, it's the herd structure that is reconstructed by the footprints. But might this not clue us in to herd behavior as well? It's reasonable to suspect that prehistoric elephant families whose members traveled together also shared emotional bonds. Seven million years ago, there were no Homo sapiens on our planet; our lineage was either in its extreme infancy or soon to evolve. I love to imagine the trackway elephants roaming a world without us. "In 'Elephant Breakdown,' a 2005 essay in the journal Nature, [psychologist Gay] Bradshaw and several colleagues argued that today's elephant populations are suffering from a form of chronic stress, a kind of species-wide trauma. Decades of poaching and culling and habitat loss, they claim, have so disrupted the intricate web of familial and societal relations by which young elephants have traditionally been raised in the wild, and by which established elephant herds are governed, that what we are now witnessing is nothing less than a precipitous collapse of elephant culture." Siebert notes, and I agree, that the evidence for elephant PTSD is compelling. It's only gotten worse for elephants in the years since he wrote his piece, as the current situation in Cameroon exemplifies. Elephant slaughter is terrible enough; on top of that, the survivors suffer emotionally. Thanks to the discovery of the elephant trackways, we know that elephants have lived in complex social units for at least 7 million years. For all the millenia intervening between then and today, elephants have survived and adapted. I hope that they can survive what we're doing to them now.